Definition and Meaning of Culture: What is the Meaning of Culture? The Meaning of Culture has many different inter-related meanings that characterizes a group, or tribe, of people in terms of their beliefs, practices and behavior. These patterns of behaviour and beliefs have endured across the many different Indian tribes and generations of Native American tribes. The meaning of culture is reflected in the Native American Indian way of life. The characteristics used to define and describe the meaning of culture are: ethnicity, language, society, religion, beliefs, legends, mythology, customs, traditions, values, behaviour, dress, ceremonies and rituals. The Meaning of Culture can be described as that which distinguishes life in one group or tribe of people, from life in another group. When one Native American Indian tribe encountered another it was usually because one group was invading the territory of another leading to warfare and conflict. 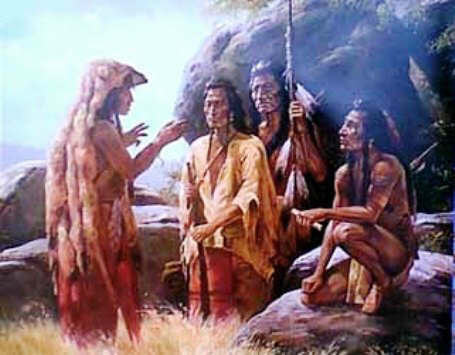 The Iroquois Confederacy aimed to create an empire by incorporating subservient conquered peoples into their culture. The Iroquois Confederacy destroyed several large tribal confederacies including the Hurons, Eries, Neutrals and Susquehannocks whose culture was then lost. The Meaning of Culture and a further example of cultural diversity led to the ultimate culture clash between the Native Indians and the Europeans. The culture and pre-historic Stone Age lifestyle of the Native Indians had not changed to any great degree over hundreds of years. The Native Americans had never undergone the changes of the Bronze Age or the Iron Age. Their weapons and tools were all made of stone, they had not experienced the use of metals. Neither had they experienced the beliefs, behaviour, and way of life of the Europeans. These two distinct groups of people were literally from different worlds - neither understanding the culture of the other. Under these circumstances a culture clash was inevitable. Distrust and hostilities grew between the indigenous Native Indian population as the number of European newcomers increased. This culture clash was a major cause of conflict in the 1700 and 1800's. "Great Spirit and the Maker of all Life...a warrior goes to you swift and straight as an arrow shot into the sun. Welcome him and let him take his place at the council fire of my people. He is Uncas, my son. I, Chingachgook - Last of the Mohicans."